After my first Benchmade knife, Saddle Mountain Skinner, I quickly got addicted to the brand. I’ll admit that at first I was not into this brand because it had a butterfly on their logo. I was so wrong. You should never judge a book by it’s logo. The skinner is a great knife and I used it as my everyday carry for a while but I found that I was afraid of the gut hook than I thought. It’s still as sharp as it was when I first bought it and the gut hook puts a little fear in those who see me wield it. The reality was that I only used the gut hook once to help me separate some pork belly. Oh wait, there was a time I used it to open a box. I’m sure the box was afraid when I pulled out the knife. My hunting trips never happened so I figured I should just be normal and carry a regular knife. My hunt for a new knife started. I looked at Kyocera, SOG, Spyderco, and of course Benchmade. I was also leaning heavily towards a folding knife. After trying many of them out and actually talking to people that own some, I decided to stick with the fixed blade. No bells or whistles. Part of this because I’m afraid of folding mechanisms. I even have nightmares of malfunctioning folding knives. The fixed blade reduces my options. 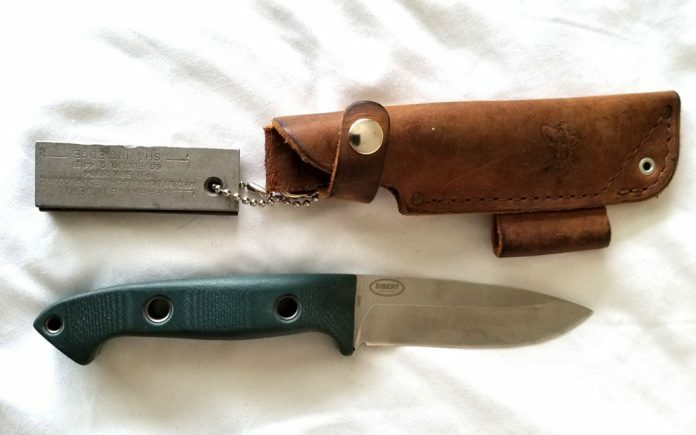 I read review after review on all the fixed blades and no matter how great the review was, I was drawn to the Benchmade Bushcrafter. One of the reasons I was drawn to this fixed blade was due to its blade thickness. This blade is 4.17mm thick. This is much thicker than most of the fixed blades out there. The other reason I like the fixed blade is because it reminds me of kitchen knives. I forgot to mention that the S30V is also a culinary steel. At this point, I hope you realized I bought it. The handle made it the overall winner for me. This handle is made from G10. G10 is a high-pressure fiberglass laminate, a kind of composite material. G10 is very similar to Micarta and Carbon Fiber laminates, because they are all resin-based laminates, except that the base material used is glass cloth. The titanium tubing is practical where I can see myself using them to mount the knife to the end of a stick.